If you own a smartphone, then you probably know that its battery life is nowhere near as good as old-fashioned "dumbphones". There are lots of reasons for this, but usually the biggest issue is the screen. It simply takes more power to illuminate a big touchscreen display than a small one, but surely this power drain is a fact of life? Well.. not exactly, because if you own an eBook reader such as an Amazon Kindle, then you will already have come across big screen devices that seem to last on a single charge for weeks. There are many differences between an eBook reader and a smartphone when it comes to power drain, but one major one is the display technology. Where smartphones and tablets use some sort of LED or OLED technology, an eBook reader will generally use an electronic ink display, sometimes called an electronic paper display or electrophoretic display (EPD). These have been around for a long time, and first appeared in the Motorola FONE F3 five years ago and more recently the Samsung Zeal sported an EPD as a sort of keypad. Modern EPDs boast up to 400 dpi screen resolution and can be as large as you want, although they are still limited to being monochrome-only panels. 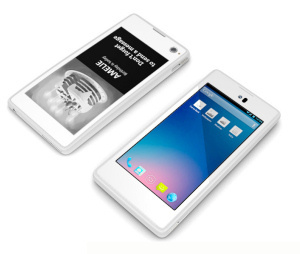 So why not use an EPD in a smartphone? Well, the refresh rate on an EPD is very, very slow.. and the black-and-white technology is not suited to a lot of smartphone applications.. you couldn't play a game or watch a video for example. But some things work just fine on an EPD, such as pages of text (a book or your email perhaps), status displays and quite a lot of other simple applications. But it seems that you can't have the best of both worlds. Well, not at the moment anyway.. not until the YotaPhone comes out. 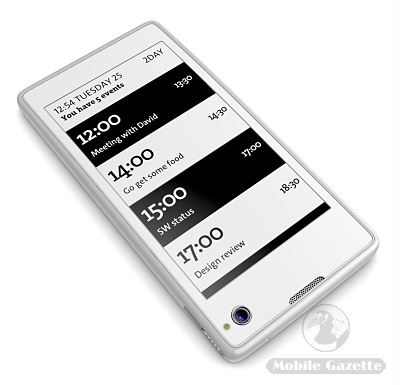 The YotaPhone is designed by a spinoff of the Russian Yota mobile network, and it features an LCD panel on one side of the phone, and an EPD on the other. Because EPDs are relatively thin and lightweight, the YotaPhone isn't much bigger than a standard smartphone, but Yota Devices say that it has about twice the battery life. Quite how Yota Devices is going to make the YotaPhone work is a mystery, but we should get more details in the spring when Yota show off the YotaPhone at MWC in Barcelona. The YotaPhone will not only have to work with multiple screens, but those screen will have different technical characteristics - a fast, multitouch colour screen on one side, a slow mono screen on the other with rudimentary touch support at best. There needs to be some clever software trickery here, but Yota devices have been working on this since 2010 so presumably they have ironed a lot of these issues out. Apart from the dual-screen, the rest of the YotaPhone's specifications are pretty familiar. There's a 4.3" 720 x 1280 pixel full HD display on one side with an HD camera for video calls. On the other side is a 4.3" EPD panel of unknown resolution plus a 12 megapixel primary camera. Inside is a dual-core 1.5GHz Qualcomm MSM 8960 processor with 2GB of RAM and either 32 or 64GB of non-expandable flash memory. The YotaPhone supports LTE 4G data, NFC and wireless charging. This will be an Android 4.2 smartphone (when, and if, it hits the market), with all the usual features that you would find on an Android phone, including 3.5G support, WiFi, Bluetooth and GPS connectivity. 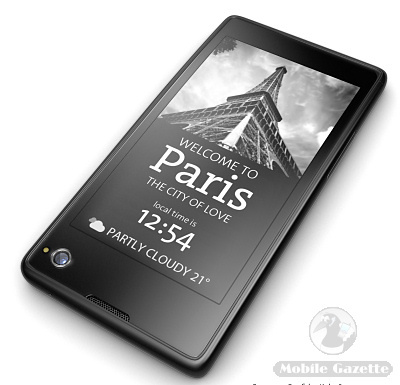 We would assume that the YotaPhone also supports GLONASS as that is just as Russian as Yota. Inside is a relatively large 2100 mAh battery, and Yota say that the YotaPhone measures 131 x 67 x 10mm and weighs 140 grams. Available colour schemes will be white or black. We don't know how much the YotaPhone will cost, but the additional hardware costs of adding the additional EPD panel shouldn't be that great. However, the amount of effort that it will take to get the software working will probably be substantial, so we imagine that this will command a hefty premium. If you want one of these then you will probably want one right now. 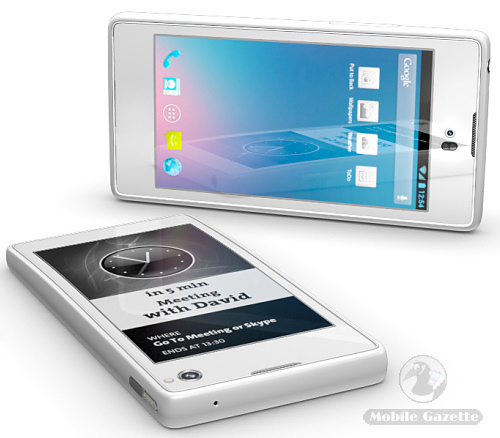 The problem is that Yota say that the handset will start to ship in Russia in Q3 2013 and elsewhere in Q4 2013. That's a long wait, and the chances are that the specification will change somewhat in that time, and of course there's the risk that it might be cancelled altogether. But there's a fair chance that Yota may have created something that will be extremely desirable, and just perhaps we will see the birth of another significant player in the mobile phone market.